If you find a lower advertised price on any IOTA Engineering product, give us a chance to match or beat it. In most cases we can! Call us at 1-800-367-3019 or e-mail us at sales@donrowe.com. 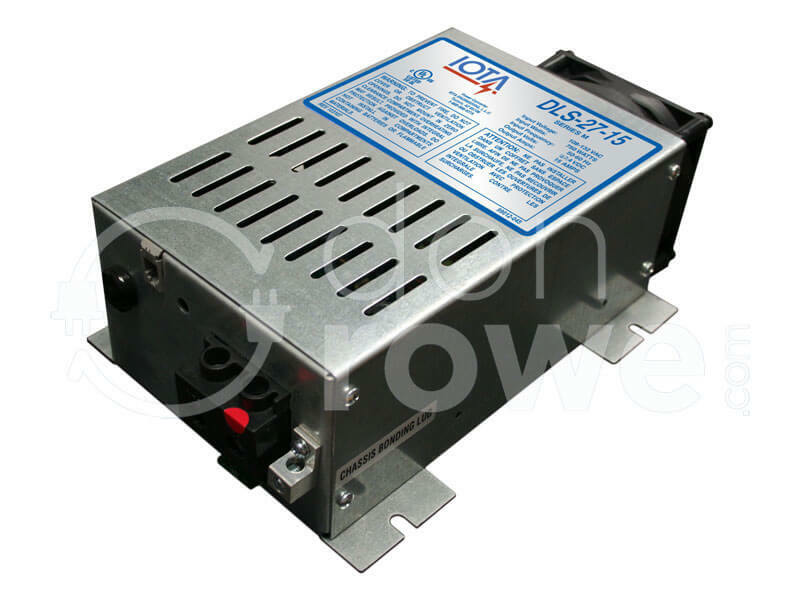 The IOTA DLS-27-15 Converter/Charger was designed with the RV user in mind...providing clean output for the operation of DC equipment, virtually silent fan operation, and the built-in protection features that guard the unit against low transient AC voltage from pedestal supplies. Additionally, features such as the IQ Smart Charge Controller option allows the DLS-27-15 to maintain batteries while the RV is not in use. The DLS-27-15 Converter/Charger converts nominal 108-132 AC voltage to 27.2 DC voltage for both DC load operation and 24V battery charging. As a power supply, the unit's tightly controlled regulation allows the user to operate a nominal 24VDC load up to 15 amps. As a battery charger, the DLS-27-15 will maintain the battery, delivering its full-rated current when the battery capacity falls sufficiently low. The voltage is set to deliver its maximum current for the necessary period of time to minimize undue stress to the battery caused by heating of its cells. This helps to ensure the longest possible life of the battery. Over time, as the battery nears its full capacity, the DLS-27-15 will automatically drop the current, providing a float-charge to the battery to prevent self-discharge of the cells. The IOTA DLS-27-15 is also an ideal component for photo-voltaic systems, taking AC input from the system's inverter or line power from grid-tie systems and converting it to DC voltage for maintaining auxiliary battery banks. IOTA’s Dual State Charging, tight Line/Load Control and Switch-Mode design make the DLS-27-15 Converter/Charger a powerful, efficient, and compact battery charging and power conversion solution for almost any application. © 2000- DonRowe.com. All rights reserved.